Chaidh mi fhèin is Jenny air turas romansach gu Venice (Venezia ann an Eadaltais) aig deireadh na seachdain. Gu fortanach, bha an t-àite-fuirich gu math snog is cha robh e idir coltach ri rudeigin sleazy a-mach à clàr Guns n’ Roses! 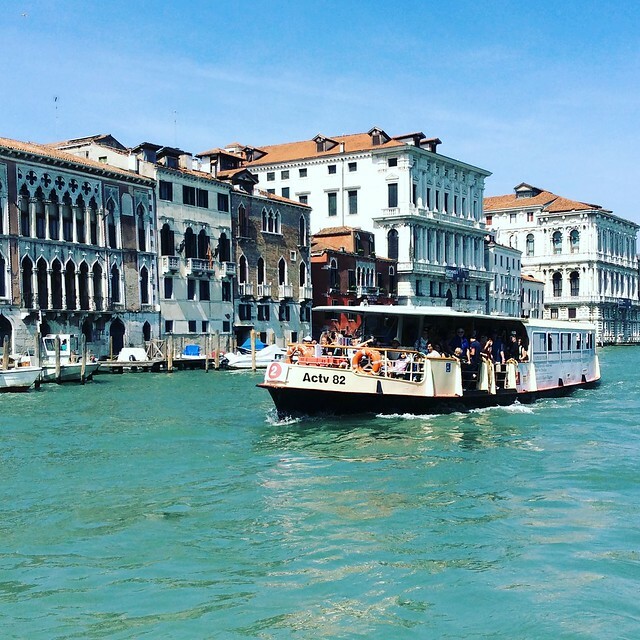 Nis, tha Venice uamhasach ainmeil airson nan canàlaichean, gu sònraichte an Canal Grande. An àite busaichean agus trèanaichean, ’s e bàtaichean a’ phrìomh mhodh chòmhdhail sa bhaile. ‘S e ‘vaporetti’ (’stiomairean beaga’) a chanar ris na busaichean-uisge a th’ aca – ged is e dìosail a tha iad a’ cleachdadh sna làithean seo, a’ gabhail a-steach bio-dìosail air a dhèanamh le seann ola bho na taighean-bìdh. Tha na vaporetti gu math saor is gheibh thu deagh thuras den bhaile is cothrom na seallaidhean uile fhaicinn bhuapa. Tha loidhne 2 gu sònraichte math – tha seo a’ dol air a’ Chanàl Mhòr air fad gun a bhith a’ stad aig a h-uile stad. Chaidh sinn gus na h-àiteachan ainmeil uile – Ceàrnag Naomh Mharcais, Lùchairt an Doge Drochaid Rialto agus an Campanile. Bha sinn uamhasach math ach tha rud uamhasach neònach mu Venice – bha an cleasaiche sreath-mhurtaireach bhapaidhreach (no vampire serial killer clown mar a chanadh luchd na Beurla) Pennywise bhon fhilm It ri fhaicinn air feadh a’ bhaile a rèir coltais. Seo dhà no trì dealbhan a thog sinn dheth sa bhaile. Am bu toil leat balùn? Agus bha pennywise ceart, THA a h-uile rud air fleòd shìos ann am Venice! Ach dè mu dheidhinn trèanaichean, tramaichean is tràilidhean? Ged a tha Venice ainmeil airson bàtaichean is canàlaichean, tha trèanaichean is tramaichean ann cuideachd. Tha an t-eilean ceangailte ri tìr-mòr na h-Eadailt le drochaid rèile agus tha stèisean rèile mòr ann am Venice. A bharrachd air an drochaid rèile, tha drochaid rathaid ann eadar Venice is tìr-mòr cuideachd agus tha loidhne-trama air an drochaid a tha a’ ceangail Venice ri baile mòr Mestre. ‘S e loidhne meadhanach ùr a th’ ann a chaidh fhosgladh eadar 2010 agus 2015. Chan e slighe-trama àbhaisteach a th’ ann idir – chan eil ach aon rèile aig na tramaichean! Tha an trama ga stiùireadh le aon rèile meatailt sa mheadhan agus tha coltas trama air ach tha e a’ dràibheadh air taidhrichean rubair mar a bhios bus! 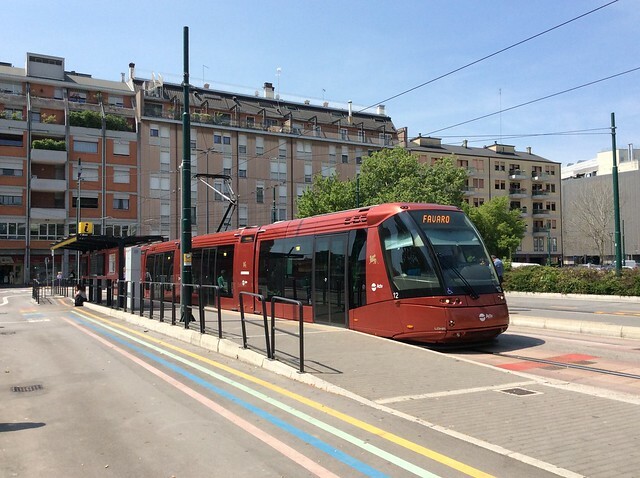 Sgrìobh mi post eile mun trama mus robh cothrom agam a dhol air: Tranvia di Venezia – an t-slighe trama as neònaiche san t-saoghal. Nuair a chaidh mi air mu dheireadh thall, bhuail rud no dhà orm. Rud a bha math, b’ e gu bheil an seòrsa trama seo nas fheàrr air tionndadh agus air dèiligeadh ri leathaidean na tramaichean àbhaisteach. Rud nach robh cho math, b’ e gun robh am fuaim bho na taidhrichean caran àrd an taca ri trama àbhaisteach. Às dèidh turas air ais gu Venice air an trama, dh’fheuch mi an rathad-iarainn eile sa bhaile: People Mover di Venezia. Tha an loidhne ghoirid seo a’ toirt daoine bho na longan-cruise agus bhon phàirce-chàraichean air eilean Tronchetto gu Venice fhèin. Tha an trèana bheag seo fèin-obrachail is gun dràibhear. Ged nach mair an turas ach mu chòig mionaidean, gheibhear deagh sheallaidhean air an t-slighe. ‘S e baile air leth a th’ ann am Venice sa h-uile dòigh, a’ gabhail a-steach nan rathaidean-iarainn neo-àbhaisteach aice! Chaidh seo a phostadh ann an rathaidean-iarainn, Rathaidean-iarainn neo-àbhaisteach, rathaidean-iarainn thall thairis, Uncategorized agus a thagadh Italia, italy, People Mover, tramaichean, Venice. Dèan comharra-lìn dhen bhuan-cheangal.